Over the last couple of days, I worked the late shift, so I decided to go for a couple of rides before work, and what a couple of rides they were. Monday, I did a simple 14 mile route around Harrogate, and according to Strava, gained over 14 personal bests, 2nd and 3rd best times. Along with a couple of This years bests, and top tens. Some of the best times I had where on the cycle path to Ripley from Bilton. There was a cyclist in front of me, by quite some distance. My competitive edge came out and I just had to catch up. They were going at some serious pelt, and took me almost a mile to catch them up. So that rider improved my time over that segment by quite a margin. So yeah, I was quite chuffed. Then I got to work and that good mood was quashed quite quickly, but thats a different story.. It was a cracking ride. Tuesday, I did the standard out to Ripley before work, and again gained a good handful of Personal bests and 3rd place times. I normally ride up in the hoods, as the layout of my bike means that this is the easiest way to reach brakes and gears. However I put myself into the drops, initially I never noticed the difference. But on the Viaduct to Bilton segment, I saw my speed was up at around 16-17 mph. Normally, in the hoods its around 13-15 mph for the same sort of effort. That small change in aerodynamics made a huge difference. When I went back up into the hoods for a while to see the difference, the speed dropped down to 14 mph, and back into the drops it went back up to 16 mph. Sunday, I did my new favourite course, and set a whole new level of bests. Over 10 miles, I improved by 1m 54s for a new time of 46m:52s, One hour 12.12 miles, 10 miles 46m:52s and 20 km 1h:02m:49s. So all in all a good couple of days, and I think I’ve earned a rest day today, as my legs are grumbling a little. I decided to head out on the bike late on my Monday off work. I had planned a 17 mile route, out to Ripley, then along the back lanes to Knaresborough and back to Harrogate. I arrived in Ripley, and headed up Ripon Road. This is a fast narrow road for traffic, but I was only on it for 200 meters or so. As it turned out, it was quiet on the road anyway. 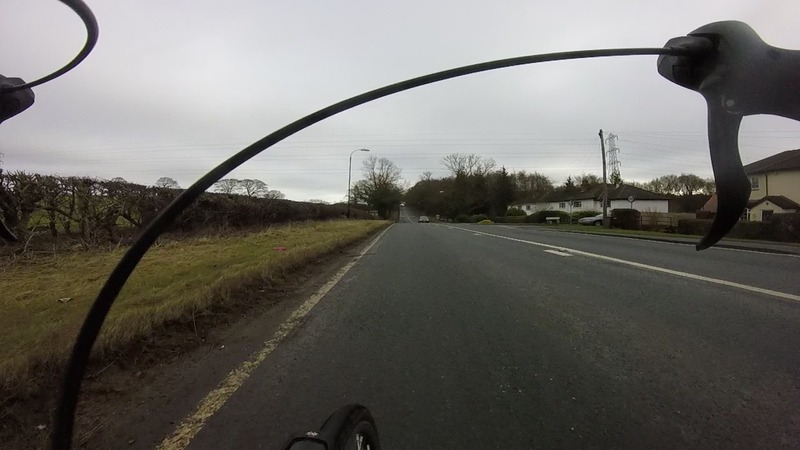 Turning Right off that road, Nidd Lane opened up before me. Lots of icy puddles, massive clumps of dirt that had fallen off tractors hampered my line. It was a gorgeous road to ride down, lots of ups and downs, but with nothing to really cause massive out of the saddle pumps, but enough to get the old heart pumping..
Nidd Lane morphed into Breton Lane, which was even more of a beautiful road. I was enjoying the ups and downs, the road curves. All too soon, the road ended onto the Ripley Road going into Knaresborough. This is another road, where the Traffic zips along at 60mph, and my healthy fear of fast moving traffic comes into force. And there was a good few more steeper hills here too. Several cars passed me overly close, others gave me plenty of room. I pummeled the road, climbed the hills and found myself in the outskirts of Knaresborough. There was some good driving by an audi driver, I’ll let the video show it, but there was lots of room given, no silliness and just very thoughtful driving, I wish everyone could cruise along like this..
Zipling along the last of the hills, I got stopped at the traffic lights at bond end. I suddenly realised how cold it was. Looked at my GPS to notice it had barely gone over 1 degree Celsius. No wonder my fingers felt like they where going to drop off. I descended knaresborough hill, pulled up at the waterside and had a drink. Then it was time for the worst bit of the ride, up the beryl Burton cycle way. It’s damn steep, and long but did it, and I a new personal best time too. The cycleway back to Bilton, is a sorry state of potholes, exposed brick and bone shaking roughness.. It’s just awful on anything but a mountain bike. Honestly Harrogate Council, you need to get the road sorted. But alas, I’ll lick a dovecot if it ever happens. The ride down Skipton road however was when the pain of the cold really kicked in. The openness of the road coupled with the windchill of a fast downhill, really chilled my bands and face to the bone. Then it was back home, where the feeling gradually returned. It was a really windy couple of days here. Gusts up to 45mph, which to be honest, felt sustained rather than gusts. I decided, as the wind had died down a little the next day, I’d head out for a quick ride. I wanted to get out the house, and check out the new new features on the Garmin 510, that have been released with Firmware 3.40. Namely the Segment support. On the cycle path toward Ripley, I was having to avoid some rather large sticks, and parts of tree that threatened to enter the spokes and throw me if I went anywhere near. The I rounded the corner and saw the casualty of the wind. A rather large conifer had fallen right over the path, blocking it all. the only way round was to pick the bike up and walk round it cyclocross style. At times I was having to lean at quite an angle to deal with the wind. 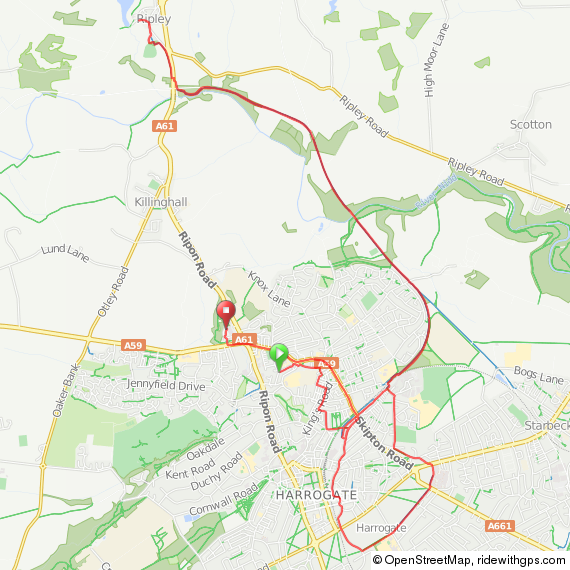 It was pretty much a headwind all the way to Ripley, and quite a struggle to keep a half decent pace going. On the way back, the effect of the wind was dramatic, as it was pretty much a tailwind for parts, effort was’nt really needed to move forward at a pace that saw me get some good times according to the new feature on my Garmin. My best previous time was set on the 23rd of December at a time of 10:41. Today it was some 23 seconds quicker, at 10:18. 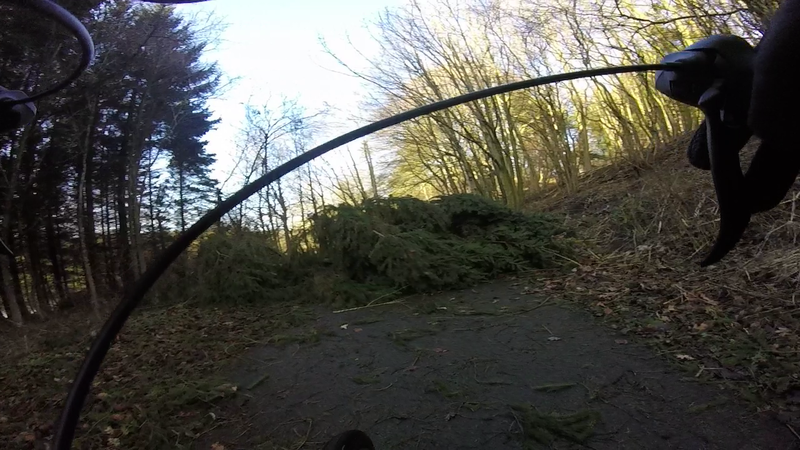 Even having to get off the bike, and carry it round the downed tree I was so much quicker, mostly due to the tailwind I had. Heading back up Bilton Lane however, was a whole different story. The wind only ever comes one way, and thats down. With a side wind when you pass a gap in the houses. It was impossible to keep any speed up, or a central line as I passed the houses. It was virtually impossible. It was pretty much my worst time ever on the Lane. The wind was just vicious. It was at this time, I decided enough was enough and gave up, and headed home. But on the bright side, the new features on the 510 worked very well, and the segment support is excellent. The Ride I went on the other day before work, was a slightly damp one. I arrived at Ripley, in the cold Sunshine. It was a lovely day. Then, on the cycle path back, it poured down. But I enjoyed it. Cruising along the quiet path, all on my tod, the bike gliding along. The jacket I had on, kept me nice and dry. But the rain coming through the holes in my helmet was a pain..
Never Mind the rain though, I pushed on, and completed a 13.5 mile circuit to work. The only downside to this ride, was a dumb arsed Mercedes Driver, who thought getting stupidly close, and sounding his horn was a good idea. When he stopped at the traffic lights, I took pleasure in articulating my anger through his window, and thats not like me. But when idiots like that put my life in danger, how is one supposed to react? Shame I never had the cameras on my bike for this ride really. I would of liked to of seen that back, just how close he came to my rear tyre. But, my thoughts and sympathy with the cyclist, and his/her family that was critically injured on the same day in Harrogate. First, I want to beat my Personal best time on Bilton Lane. This is an awesome sprint segment, and apart from the small speed bumps, and dodgy drivers, some speed can be gained. 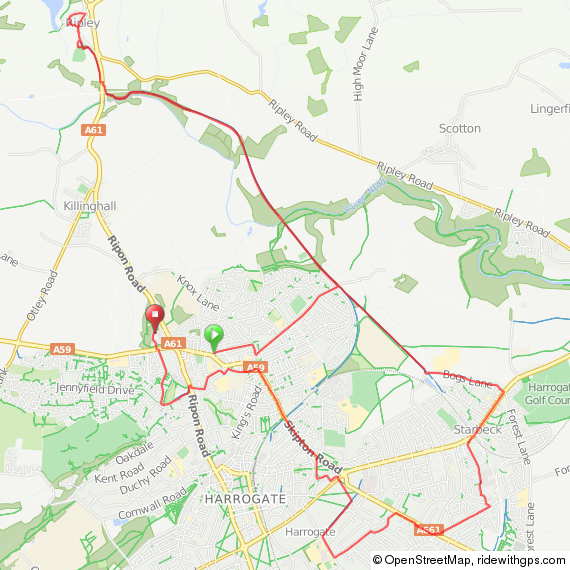 My personal Best is currently 1:36, with a average speed of 25.3mph. And that was on the 26th October 2014. I am convinced, if I keep myself in an aero position and keep up the cadence, I can beat it. It proves elusive though. I’ve come close, 1:37, but be damned if I can beat 1:36. The other main segment I would like to beat is Skipton Road. This is a difficult one due to traffic lights, and traffic. My previous best time was 6:13, average speed of 13.6 mph. I know I have done better than this, but that was when I worked in Starbeck, and came home when the roads where really quiet on a night. So they are the two segments I really want to beat. We shall see how close I can get, and when I beat them,… 🙂 My only other target is to generally get faster, and be able to pace myself for longer. So, I have decided I’m going to set this years milage target at 1,000 miles. Thats quite a distance, but I feel it is achievable, pending any mechanical issues, or other unknowns. 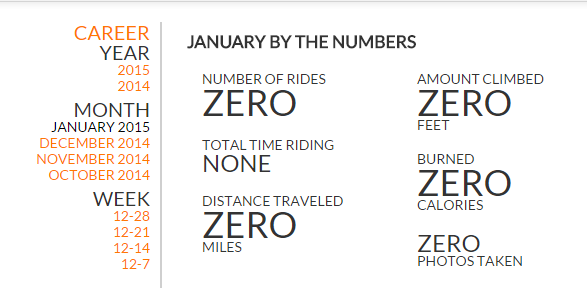 So, heres to 2015, get out there and ride. Targets are good, but you should just be out there having fun, and riding!